With that said, Steady State Cardio, primarily jogging and elliptical work, can be one of the least effective tools for Fat Loss – Period. In fact one of the most interesting studies I’ve ever read showed that as you age, if running is your primary mode of exercise, you will continue to gain weight. You can read the study here. Now that that statement and study is on the table, let’s discuss how you can effectively use cardio to your advantage instead of it hindering your efforts. First, let’s look at the pros and cons of Cardio for Fat Loss and then look at how you would integrate cardio into your routine. 1 – It will help with recovery. If you’re doing a lot of strength training, cardio will not only help with recovery in the short-term, but also the better shape that you’re in, the quicker you’ll recover normally. 2 – Once you drop below a certain percent of bodyfat, you will need cardio to continue seeing results. For some people, that number can be quite high (20+%), for others it can be quite low (7%). Where you fall on that continuum is really hard to determine unless you’ve been consistent with your workout (strength) regimen, diet and moving more overall. Even then, there will be other factors involved, such as how well you handle carbs, how much you’re sleeping, how much stress you have, how often you sit during the day, etc. In other words, if you’re fairly active, handle carbs well, get enough sleep, have only a modicum of stress, eat damn well and work hard when you’re strength training, then you most likely won’t need too much “cardio.” For most of the people I know and interact with, that’s just not the case and therefore will need some cardio to continue to see improvements. 1 – More people rely solely on cardio for fat loss. The fact is when relied on solely, cardio will eat away at muscle, slowing down one’s metabolism and thereby increasing the propensity to store more fat while losing more muscle. This can quickly spiral into a viscious cycle of muscle loss and decreased metabolism. Therefore, a multi-pronged approach to Fat Loss is essential, starting with the first 10 rules in this series. 2 – Musculo-Skeletal injuries are increased for those that rely solely on cardio for fat loss. In other words, knee, hip, ankle and back injuries are much more common in those that only run for fat loss. These injuries are usually “worked through” and only continue to become exacerbated as time goes on. Without the accompanying stretching, foam rolling, activation exercises and strength training to balance out the imbalances that occur from lots of steady state jogging, injuries continue to mount over the years and people think it’s from “old age.” The truth is it’s not from your age (although that doesn’t help), it’s more from not having a multi-pronged approach to health and fitness. There are other things which one can say for and against cardio. One more “pro” can be that steady state cardio can help to increase dopamine levels which helps with focus. One more “con” can be that it increases cortisol levels which causes people to store more fat around their mid-sections. When you start getting into the minutia of these details though, you start missing the bigger picture. What is the bigger picture? That cardio may or may not be good for your fat loss efforts, depending on the variables I listed above. If it’ll be good for you, then add it. If not, then don’t. 1 – There is more than one way to do cardio. Monday’s Video post talked about 4 great exercises that you can do that completely banish “traditional cardio” methods. In other words, you can jog, do sprints, sled work, Tabata method, metabolic resistance training, complexes, Kettlebell work, etc. 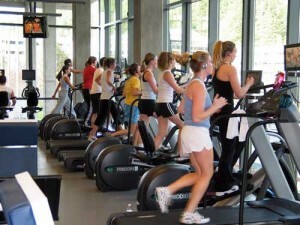 Too often when people think cardio, they think the slow and steady cardio of treadmill jogging or elliptical work. Know that there’s more to “cardio” then those two exercises. 2 – Everyone will have a preference for the types of cardio that they like. Some people dis-like treadmill jogging. Others absolutely love running outside. Yet others would never run, but don’t mind doing bike sprints or sled work. Just because you have a preference though doesn’t mean that you shouldn’t switch it up every once in a while. 3 – In general, most people respond best to some sort of High Intensity Interval Training. This is mainly because it helps to cut down on the time and boredom aspects of steady state cardio. 4 – How intense your cardio should be is correlated with how well you handle carbs and whether or not you’re currently eating them. If you’re eating a lot of carbs, then you should be able to handle high intensity interval training a bit better than those on a low carb diet. If you handle carbs really well, then you will more than likely need less cardio then if you don’t. In other words, if you gain fat very quickly from eating carbs, then you will need to do more cardio to lose your stubborn body fat. On the other hand, if you handle carbs well (genetically blessed), you won’t need as much cardio to get “shredded.” You might need some or you just might be happy getting to 8-10% bodyfat (for men) without any traditional cardio work. 5 – Your heart rate is king when determining how “intense” your cardio is. Intensity isn’t determined by how much your “legs burn” or any other local fatigue factors, but instead how hard your heart is working. If your legs are “burning” but your heart rate is only 120 beats per minute (bpm) then you should really pick another exercise to get your heart rate up. 6 – Your ability to recover and hold onto muscle are the main determinants of how to switch up your cardio regimen on a bi-weekly basis. If you feel and look gaunt after adding cardio into your normal routine, then you might need less cardio in general or less intense cardio in order to keep the muscle you have. Also, if you’re not recovering quick enough to do your strength training workouts, then you also might have to cut back on the intensity or volume of cardio work. 7 – Women can generally recover quicker from HIIT methods than men. Actually, that’s only part of the story. In general, women can do more total body workouts, at a higher percentage of their 1RM and recover quicker than men. By recover, I mean from the time they last worked on a certain body part to the next time they work that same body part, they’ll be less sore and be able to lift a higher percentage of their 1RM. Men can usually lift more weight overall, but women can do more work, more often. With that said, they typically can do more HIIT while keeping more of their muscle (if their strength training is on point) than men. With all of those points out on the table, let’s now discuss how to incorporate cardio into your workout routine. 1 – Figure out the “intensity” for your workouts. This means calculate your heart rate percentage based on your max heart rate of 220-age. So if you’re 30 years old, your max heart rate (in theory and scientifically this is all over the map), should be 190 bpm. This number although not necessarily “accurate” will help to give you a starting point. From there, break down your intensity levels into low, medium and high intensity. High – Anything over the medium range and is really “all-out” effort. 2 – Complete the cardio after a strength training workout or on it’s own separate days 3-4 days per week. Never before a strength training workout. For Men*: 2 Days a week complete 30-45 minutes of low-intensity cardio (incline walking) after your Strength Training Workout. 1 Day a week complete 10 minutes or 20 cycles of high intensity interval training (sled work) after your strength training workout. 1 Day a week complete a medium intensity (jogging) cardio routine for 30 minutes on an “off” day. For Women*: 2 Days a week complete 10-15 minutes of HIIT after your strength training workouts. 1 Day a week do a medium intensity (jogging) routine for 30 minutes after your strength training workout. 1 Day a week complete a low-intensity (walking) cardio workout for 45 -60 minutes. *Both of these recommendations is assuming a limited amount of carbs in the diet (about 100-150 grams on average per day – so 700 – 1050 per week). If you have more, you can do more HIIT. There is a place for cardio, but you should really ensure that you’ve set yourself up with a good strength training routine, have set up your diet correctly, are eating whole, natural foods, are moving more in general and are taking the basic supplements for health before relying heavily on cardio for fat loss.